A mainly sunny sky. High 89F. Winds light and variable.. Mainly clear. Low 57F. Winds ESE at 5 to 10 mph. Jason Schaller, a student in the Graduate Interdisciplinary Program for Entomology and Insect Science, holds two Dynastes beetles (aka Western Hercules beetles) from Mount Lemmon. Jeremy Carriere looked a bit wary as he prepared to eat a caterpillar last year. You can sample waxworms Saturday. As the monsoon nears an end, insects are at a peak. Beyond the mosquitoes that thrive in backyards filled with standing rainwater, many other more appealing critters are in their adult stage and highly visible. They are also the star attraction of one of Southern Arizona's newest and most unique expos - the Arizona Insect Festival, now in its second year at the University of Arizona. The celebration of six-legged creatures drew at least 2,000 of the two-legged sort over four hours last year. Organizers expect even more on Saturday, when the festival moves indoors to the Student Union Memorial Center. 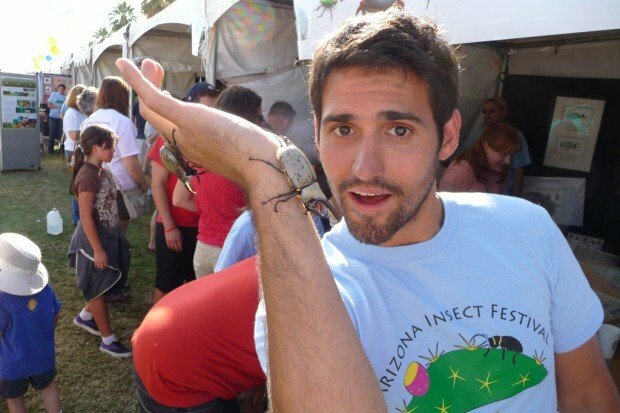 Organized by the UA's entomology department, the festival includes researchers from a variety of fields of study - including the neurosciences - that span the campus. The idea is to help people learn about the importance of insects (most animal species are insects), and also to discover the range of insect-based research taking place at the UA, said Kathleen Walker, an assistant professor in entomology. The UA has one of the largest collections of insect scientists in the United States, she said. One of the most delightful surprises from last year, she said, was how so many top researchers were able to share their excitement with the public in fun and creative ways. One popular booth last year, for example, featured cockroach racing. While many of the exhibits will be child-friendly, organizers encourage adults to come and to bring questions. On Saturday, expect 22 booths, offering everything from the lowdown on local butterflies and a look at "luminous insects" to diseases of insects, insect stings and the latest in pest control. One very topical booth, "Vampires in Your Backyard: Mosquitoes and Other Bloodsucking Insects," for example, will have lots of information on how to protect yourself, said Walker, who studies mosquitoes and does community outreach. Another will let people brush up on their scientific illustration techniques by trying to draw tiny insects they view through a microscope. "A lot of insects are so small we almost don't notice them, yet they are all important," she said. While there will be many pinned specimens, people will be able to get a close look at live creatures representing at least 50 species of insects and arthropods. Some of the animals are part of lab colonies, while others are being collected just for the festival, she said, noting that many are near the end of their life spans at the end of summer. Event-goers will be able to touch or even hold some creatures. "Something about holding a live animal is very special, not just for kids but for adults too," Walker said. There also will be a few insects that people will be able to eat. "A lot of insects are edible," she said, noting that humans have long considered insects a readily available source of protein. Samples of waxworms, which are the caterpillar larvae of wax moths, will be served on a chip with a little salsa, Walker said, describing it as a little bit of protein - not unlike shrimp. Or try nibbling on a chocolate chip cookie made with crickets. Think you'd never eat a bug? "The fact is, we all eat insects all the time," she said, because manufactured foods commonly have allowable limits of insect parts. "It's perfectly safe and in fact probably even good for you," she said. "I'm sure they try to limit it, but there's much more disturbing things than a few insect legs." Despite all that is known about insects, there are still plenty of opportunities for discovery. One of Walker's colleagues discovered a blue-winged grasshopper near Patagonia that previously had never been recorded as far north as the United States. "It's still absolutely true that anyone could find an unnamed, undescribed insect species just about anywhere, including a Tucson backyard," Walker said. She still can recall her wonder at spotting a number of brightly colored horse lubber grasshoppers along Interstate 19 soon after she moved to Arizona. Organizers hope people who spend time at Saturday's festival will leave with a deeper appreciation. "We really want people to get to know the insects that are around them," she said. 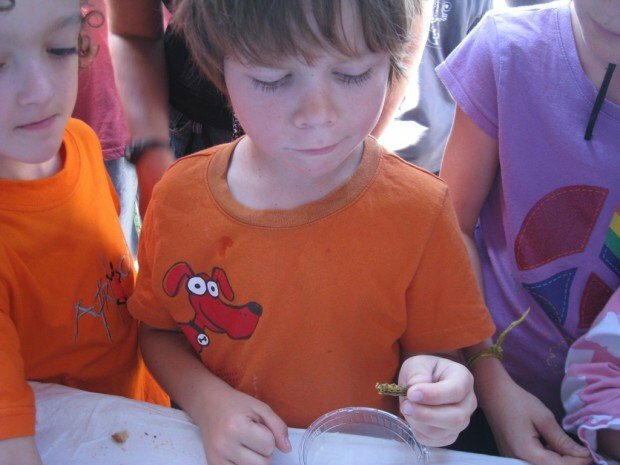 • What: Arizona Insect Festival, features 22 booths that let people explore the amazing, weird and beautiful world of insects, with an emphasis on local critters. Also discover insect-based research taking place at the UA. • When: 10 a.m.-3 p.m. Saturday. • Where: Grand Ballroom of the Student Union Memorial Center, 1303 E. University Blvd. • Cost: Free admission. Free parking in the Park Avenue parking garage. Also, items to buy and a silent auction.